Hey Kid! Wanna Buy A Used Super-Expensive Loudspeaker? Ok, let's play pretend...let's say you have $75K to $150K US burning a hole in your pocket that you want to spend on a pair of the best speakers you've ever owned. Of course, you already own a pair of $30K US loudspeakers ensconced in your listening room that will have to go elsewhere before you can install the new ones. So, what do you do? Ok, audiophile, how much would you pay for a used pair of $30K US loudspeakers? What would be the magic number that would encourage you to open your wallet? $15K? $10K? Even less? Other determining factors would be the condition of the used loudspeakers, how old they are, and what their manufacturer replaced them with. Sometimes the new model's allure overshadows the previous model in substantial ways (according to the marketing folk) that makes the older model even less attractive on the second-hand market. Almost nobody wants to dump a boatload of money into a component that has already been bettered by a newer model. 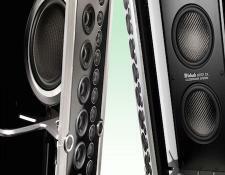 Audiophiles, by definition, want the newest, most high-performance alternative available. It's a given that anyone buying a pair of flagship loudspeakers will already own a pair of loudspeakers that will need to go elsewhere. Getting from point A (old speakers) to point B (new speakers) can be easy (but you will pay for the convenience) or hard (but you spend the least money while expending maximum effort and time). As my father used to say to me, on multiple occasions (probably because it was so universally applicable), "You pays your money and you take your choice..." And in the case of flagship high-end loudspeakers, somebody, somewhere is going to be doing some heavy lifting, monetarily and physically. Depending on your choice, it might or might not be you.